TORONTO -- Ontario will not reverse the cancellation of a proposed French-language university despite a federal commitment to extend funding for a team working on the project, the provincial government said Monday. Merrilee Fullerton, the minister of training, colleges and universities, said the Progressive Conservative government was not in a financial position to support the Universite de l'Ontario francais project at this time. "As a result, the Ministry of Training, Colleges and Universities will not provide further funding to support the development of the new university while the initiative is on pause," she said, adding that the working group could access private and public funding from other entities. Fullerton's comments came after Federal Minister of Tourism, Official Languages and La Francophonie Melanie Joly informed the Ontario government that Ottawa had provided 1.9 million in funding to a team developing the school called the Francophone Knowledge and Innovation Hub. The provincial funding for the hub and its staff was to expire on January 15. "This project is greatly supported by the community, and enjoys support across the country," Joly said in a letter Sunday to Ontario's Francophone Affairs Minister Caroline Mulroney. "I am concerned about the impact of this decision on the vitality of the Franco-Ontarian community." Plans for the school were announced by the previous Liberal government in 2017, but the Tories scrapped the project in November as part of their effort to balance the books. It would have been the first French-only university in the province, which is home to 600,000 francophones, and was set to be located in southwestern Ontario. The move sparked outrage and protests amongst Franco-Ontarians and prompted Progressive Conservative legislator Amanda Simard to leave the party caucus and sit as an independent. Normand Labrie, interim president the Universite de l'Ontario francais, said the federal money will give the hub a year to secure additional funding to continue development of the school. "We're very relieved because otherwise we would have had to let the staff go," he said. "It would have been a loss to stop the activity at this point and it would have been hard to start all over again if the government decides the pause is over." Joly said the federal government's Action Plan for Official Languages 2018-2023 could provide funding for the French-language university, but that would be conditional upon the province applying for it and committing to at least 50 per cent of the total costs. "Let us be clear, the responsibility to carry out this project lies with the Government of Ontario," Joly said. Fullerton said that by providing cash to the hub, the federal government is acknowledging its under-funding of francophones in Ontario. "We are pleased to see our message is finally getting through to the Trudeau government," she said. "This funding is a step in the right direction and we will continue to work so the federal government reduces the gap between Ontario and other provinces for funding to francophones." The Francophone Knowledge and Innovation Hub could not immediately provide comment. NDP legislator France Gelinas called on the Tory government to restore funding for the school. The federal cash does not mean the Francophone university will be sustainable in the long-term, she said in a statement. 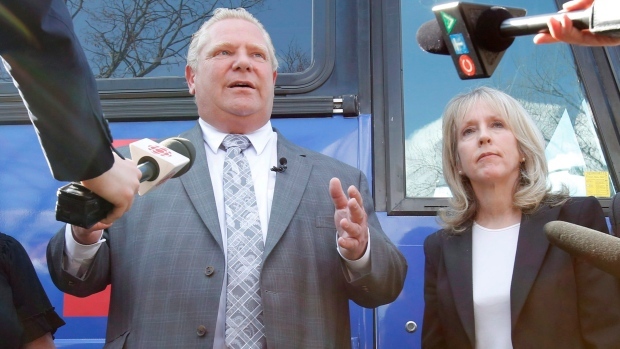 "It remains nearly certain that (Premier) Doug Ford has stopped the university from opening its doors to students in 2020 -- hurting the dreams and impacting the futures of thousands of Ontario students," she said.